Anne Koskinen (born in 1969 in Helsinki) is employing a wide range of techniques, whose approach merges the German tradition of visual art with strong personal reflection. Her works include paintings, drawings, sculptures and bronze casts. Many of her works are multipart installations. 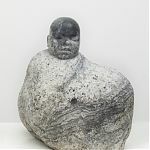 Anne Koskinen is known for her sculptures made from stone that often represent alienation or rejection. Her sculptures often reflect the theme of The Findling. This German word means both a foundling child and a boulder transported glacially during the Last Ice Age. 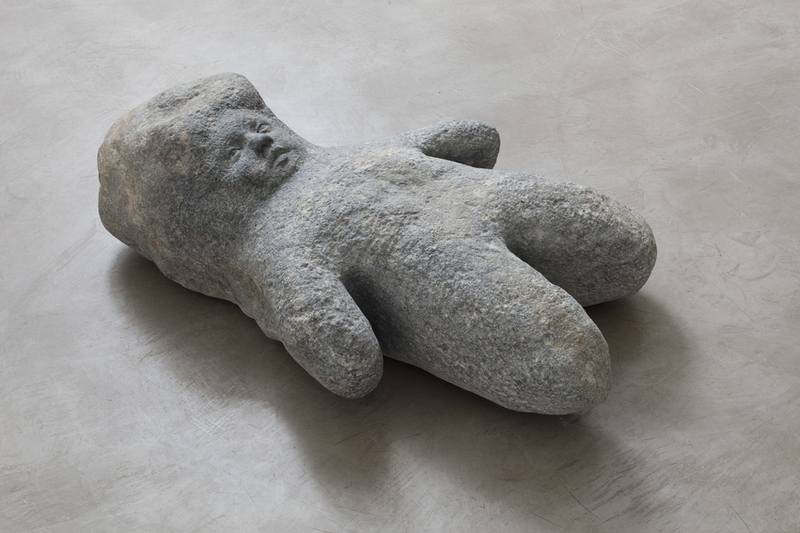 The main narrative theme of these sculptures of natural stone depicting children is the experience of being abandoned. 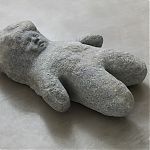 On the one hand, the works can be seen as monuments to children unaware of their roots while on the other hand they are a reminder of a practice that continues even at present- of abandoning unwanted children, often girls, leaving them to be found. The pieces were named after their day of completion, just as it is customary to give foundlings names according to the day when they were found. Her works are conceptual and analytical, involving complex and structured ideas. They are always realized in extremely fine ways, often appealing not only to the sense of sight but also to touch. And of course, to thought. The drawings and sculptures in stone are related to each other. 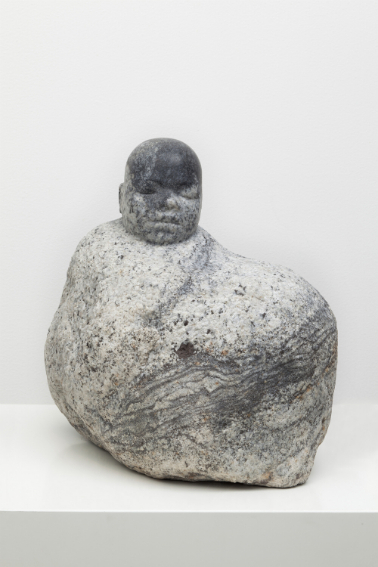 In both the drawings and the sculptures Koskinen has studied what is required, or how little is enough, for the viewer to comprehend the form and subject of a work – what it ‘represents’. Koskinen is often inspired by her personal experiences and situations in life. She examines and reiterates her experiences and applies the highest technical mastery even to works that deal with tragic emotions. 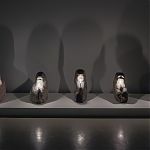 The spare appearance of her art conceals conceptual insights and humour. Koskinen makes her works herself from start to finish, for she wants to bear witness to each stage of creating the picture and to influence it. Pristine natural stone contains the still-possible, the uncertain and the not-yet finsihed. The works of sculpture are made through negation. In order to reinforce the beginning of an image in natural stone, the artist removes stone, which on the other hand is the sine qua non of the whole sculpture. What remains untouched alludes to what lies beyond making an image. Often the subjects of her studies are practices and philosophy of art. She is, for instance, interested in how an original is distinguished from its copy. Addressing the thematic of care and achieving maturity, the artist drew the images of the girls in her childhood home, where she moved after the death of her mother and where she had last lived as a teenager. A conceptual model for the works can be found in the drawings that teenage girls make on the margins of pages in books or on the inside covers of notebooks. The drawings are imaginary pictures based on memory: they follow no real examples and are based instead on the artist’s earlier observations. Koskinen describes her memory-based working process as ‘the shortening of reality’, where unnecessary visual noise has been filtered. She is interested in a reduced drawn image that invites viewers to consider the artist’s choices and motivation. Why was this particular image made ? Why does the image disappear from this part? Her actual works are a continuation of Koskinen’s “Findling” series, which she has worked on since 2012 and in which the artist is fascinated by the relationship of image and matter – how an abstract, invisible concept and a visible, concrete and sensory image are connected to each other. Anne Koskinen has studied at the Karlsruhe Academy of Art and the University of Freiburg in Germany, and in Finland at the University of Art and Design Helsinki (present-day Aalto University) and the University of Helsinki. 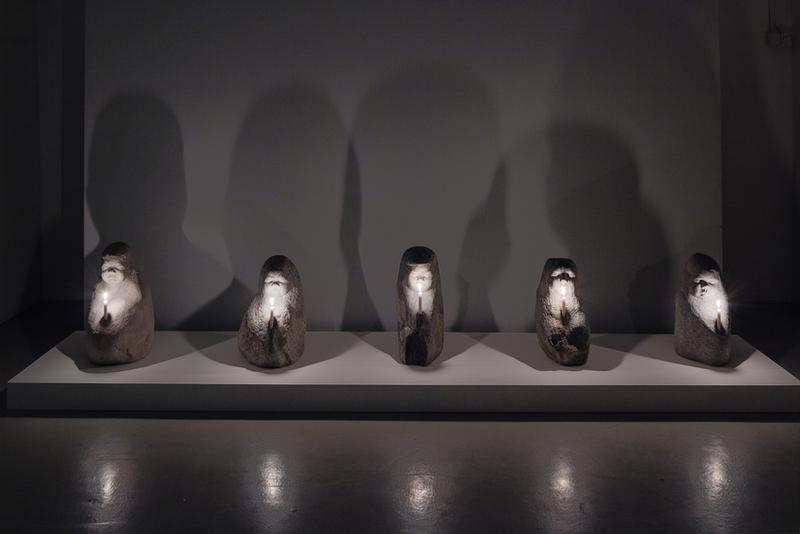 In recent years, she has participated in group exhibitions at Kunsthalle Helsinki (2017), the Rovaniemi Art Museum (2015 –2016), Schloss Agathenburg in Germany (2015) and the gallery of the Royal British Society of Sculptors in London (2015), among other venues. In 2016, Koskinen made ’The Apple of a Nuclear Physicist’ upon commission from the Finnish State Art Commission. This work is located outside the VTT Centre for Nuclear Safety in Otaniemi, Espoo, Finland. Koskinen’s work is found in The Sander Collection in Germany, in Saastamoinen Foundation Art Collection, EMMA Espoo Museum of Modern Art, Espoo, Finland The State Art Collection, Finland Kiasma Museum of Contemporary Art, Helsinki, Finland Helsinki Art Museum, Finland The Henna and Pertti Niemistö Collection of Contemporary Art, Hämeenlinna Art Museum, Finland Finnish Museum of Photography, Helsinki, Finland Göteborg Museum of Art, Gothenburg, Sweden Malmö Art Museum, Malmö, Sweden European Parliament’s Collection, Brussels, Belgium Museum of Contemporary Art, Tampere, Finland Wihuri Foundation, Rovaniemi Art Museum, Finland Nordiska Akvarellmuseet, Skärhamn, Sweden Collection Swanljung, Kuntsi Museum of Modern Art, Vaasa, Finland Swedish State, Swedish Embassy, Washington, DC, USA Vexi Salmi Collection, Hämeenlinna Art Museum, Finland Christoph Merian Foundation, Basel, Switzerland Regierungspräsidium Freiburg, The State Art Collection of Baden-Württemberg, Germany Regierungspräsidium Karlsruhe, The State Art Collection of Baden-Württemberg, Germany City of Helsinki, Finland University of Brno, Czech Republic Sculpture park Orlík, Czech Republic City of Dreieich, Germany Sparkasse Wolfach, Wolfach, Germany City of Pori, Finland University of Art and Design Helsinki, FinlanSparkasse Wolfach, Wolfach, Germany.